Momma4Life: It's Time for WordGirl's Word of the Month for July! It's Time for WordGirl's Word of the Month for July! Summer is heating up, which means it’s the perfect time for outdoor play and learning – WordGirl style! Scholastic Media’s Emmy Award-winning animated TV series for the school-age set will help keep your child’s vocabulary skills building this summer. 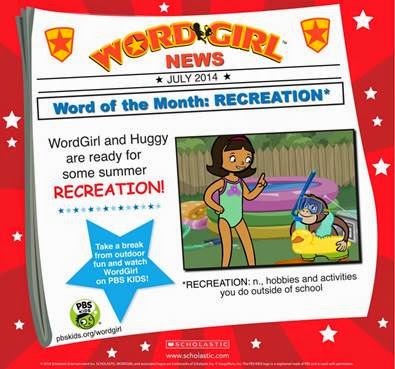 The word-powered superhero is always ready for some fun in the sun, so it’s only fitting that July’s WordGirl Word of the Month is…RECREATION! From swimming and campfires to trips to the beach and playing outside, the list of summertime activities – and vocabulary words to describe them – is endless. And WordGirl is where to tune-in for some vocab-building action this summer!